Pittsburghers have a number of transportation options at our disposal. Most drive cars, though among large American cities, we come in third place for the number of residents who walk to work. We have a light rail line and a mesh of bus routes, with a fleet of new buses in the pipeline—not to mention Bus Rapid Transit ambitions. Bicycling (hop on your own or grab a Healthy Ride) has grown more popular in recent years as infrastructure changes keep up to match it. We’re a center of the nascent self-driving vehicle technology, and we’re home to two historic funicular inclines. And, if it strikes your fancy, you can always catch an amphibious Just Ducky truck boat or a boozy party pedaler. But maybe your ideal mode of transportation is something else entirely: Independent and often stylish, some Pittsburghers take to the streets on motor-driven cycles known as mopeds and scooters. As two-stroke engine kits designed to mount onto bicycles began to appear in the 1950s, manufacturers like Puch, Tomos, and Minarelli constructed complete vehicles, simple in design, to keep costs low for the consumer. Gaining popularity through the ‘60s as a trademark of Mod culture in the UK, the scooter, or motor driven-cycle, became a symbol of both practicality and romantic style: Think of iconic cinematic appearances like in Roman Holiday or Quadrophenia. There are a lot of terms for two-wheeled, motor-powered cycles, and each is recognized in a different way by the state of Pennsylvania. Below is a quick explainer of how the Commonwealth of Pennsylvania differentiates among them. Electric bicycles, or e-bikes, are bicycles that have an integrated motor, which riders can engage for particularly steep hill climbs or extended journeys. In Pennsylvania, a “pedalcycle with an electric assist” is classified the same as a regular bicycle, and no registration or special licensing is required—but it must weigh under 100 lbs., have wheels no larger than 11 inches in diameter, have an electric motor under 750 watts that is incapable of going faster than 20 miles per hour on a level surface from its own power, and have pedals. A portmanteau of “motor” and “pedal,” the moped is a step up in motorized power from an e-bike. The Pennsylvania Department of Transportation outlines specific guidelines that define a moped, including an automatic transmission, a “maximum design speed of no more than 25 miles per hour,” and, like an e-bike, operable pedals. In Pennsylvania, mopeds must be outfitted with a special license plate, and drivers must have a Class C, non-commercial license and pay an annual registration fee of $9. Pennsylvania classifies motorcycles with less than 5 brake horsepower to be “motor-driven cycles,” which is a category that includes motor scooters. 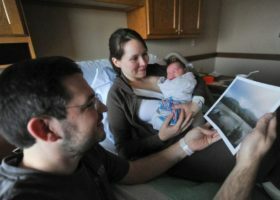 Pennsylvanians can drive scooters with a Class C, non-commercial license if the cycle doesn’t exceed 50 cubic centimeters (50cc) of engine displacement—otherwise it’d require a Class M driver’s license. All scooters require a special license plate, an annual registration fee of $9, and some detailed particulars when it comes to requiring helmets. Motorcycles are generally larger than scooters and mopeds, and their engines are positioned in the front of the bike. The classic motorcycle requires a Class M driver’s license, an $18 annual registration fee, inspection, and eye protection. In terms of parking, scooters are something of an enigma. Some owners say that since they take their own license plates, they should be considered as standalone vehicles, and these owners would pay parking meters just the same as if their ride were an SUV. Others prefer to lock them up as if they were bicycles. David Onorato, executive director of the Pittsburgh Parking Authority, wasn’t even sure himself (and, when asked for his perspective for this article, preferred not to comment). While you’ll still have to pay for metered parking, it will be way easier to find it thanks to your size. Some scooterists prefer to take their chances and chain up rather than pay. But if you’re downtown you won’t have to do either, thanks to a well-kept secret. 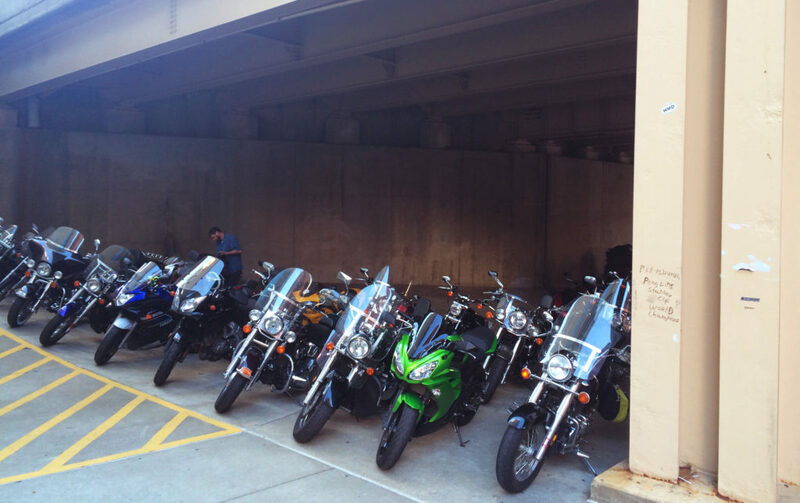 Under the 579 overpass on Fifth Avenue, a corner lot provides space reserved for free parking for scooters and motorcycles. For those looking to save money on fuel or parking, mopeds or scooters are an attractive option. And because of their size, they can be more practical to navigate Pittsburgh’s uneven landscapes, compared to the heavier motorcycle, and the motorized boost can trump the energy required of a bicycle. 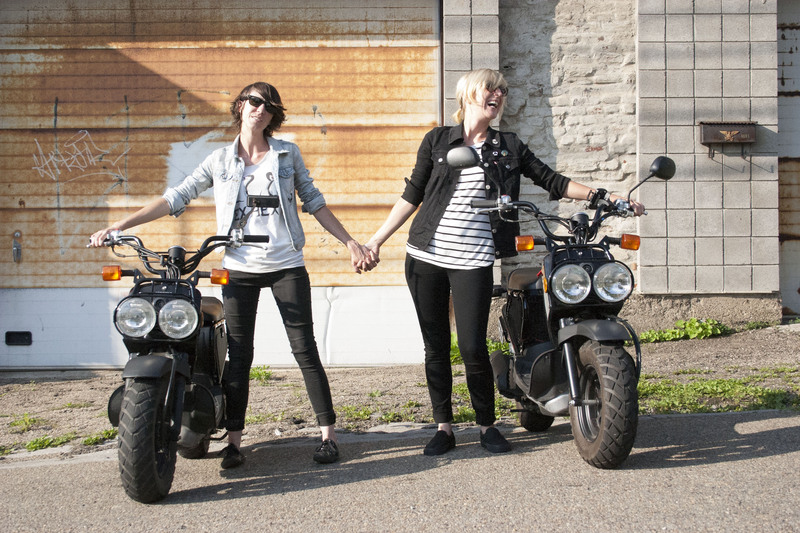 Vanessa Veltre, left, and Carrie Battle on their Honda Ruckuses in Bloomfield. “To me, riding a scooter is kind of like a vacation. I have a stressful job and look forward to getting on mine after work,” says Vanessa Veltre, a psychiatric social worker and scooter owner. 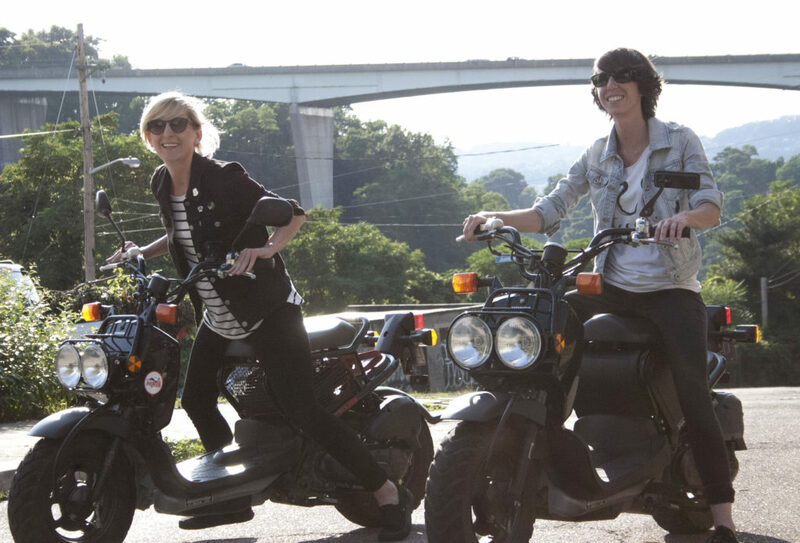 Veltre and her girlfriend Carrie Battle have been riding matching Honda Ruckuses—the rugged “bad boy” of Honda’s lineup—for years. But the thrill is just as important as practicality and efficiency, and the scooter is incomparable to a car, bike, or motorcycle when it comes to the latter. You could buy a scooter or moped from a local dealer or shop if you have the funds but if you’re looking to save money and are patient, you can find a gently-used beaut for half the cost on sites like Craigslist—or keep your eyes peeled for estate and garage sale listings. A good rule of thumb is to not pay more than $600 for a used moped and $1,000 for a used scooter, unless it’s in pristine condition. Geoffrey Frost at Slagheap Cycles. 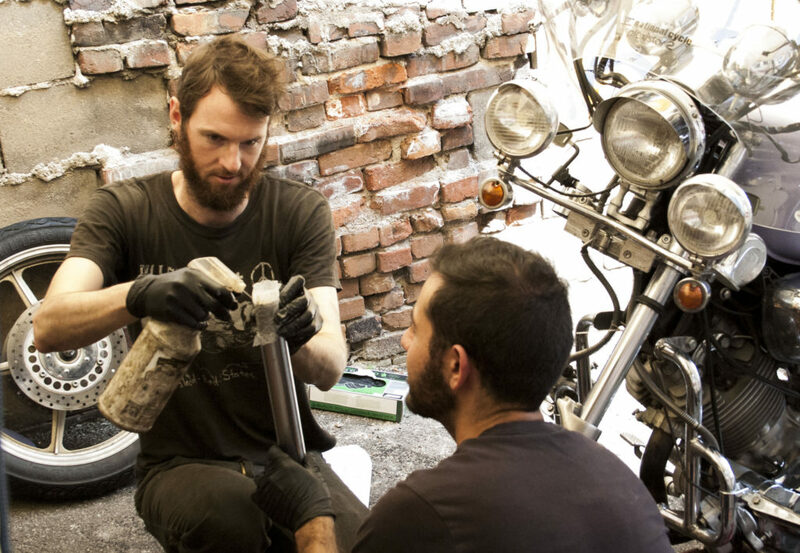 After quitting his job as a cab driver back in 2008, Geoffrey Frost left Pittsburgh for an apprenticeship at a motorcycle shop in San Francisco. When the owner wanted to move out to the country, Frost was faced with the decision to stay or leave too. After deciding to come back to the ‘Burgh, and finding a space in Millvale to rent, Slagheap Cycles was born in 2013. Three years later, Slagheap is now located on Forbes Avenue in Uptown, and there you’ll find Frost, and a few apprentices of his own, working on vintage motorcycles, scooters, and mopeds. So you’ve found a ride and a shop to call your own. But being the only one on two wheels can be lonely. Before committing to a new leather jacket, why not find some likeminded motorists? Established in 1999, the Pittsburgh Vintage Scooter Club draws inspiration from the 1960s Mod movement in the UK. Vespa and Lambretta owners make up most of the PVSC who stay true to the classic scooters that started the movement originally. 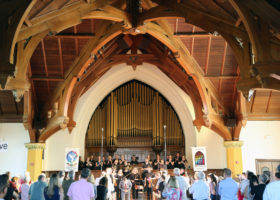 “Like any sort of subculture, there’s a lot of community involved,” longtime member Bryan McQuaid said. That community takes shape in the form of monthly meetings, a wealth of technical knowledge shared between members and BANDCAMP, one of the East Coast’s longest running scooter rallies hosted by the PVSC themselves. Like their Facebook page and brave a monthly meeting or two if you’re considering. As a transportation option—whether for a daily commute or a weekend spin—mopeds and scooters still remain somewhat under the radar in Pittsburgh. But, self-driving robotic car technology aside, several other factors may change Pittsburgh’s streetscape in the years to come. Our millennial population is increasing, and the city’s real estate development is following suit. Cars, both in purchasing and upkeep, are expensive, and gas prices will increase. And our steep hills and wintry weather can be a barrier for some to fully embrace bicycles. Perhaps it’s time for Pittsburghers to make like residents of Shanghai, Ho Chi Minh City, Rome, San Francisco, and dozens of cities around the world, and hop on a scooter.